Last night I went to see the wild ride of the movie “Now You See Me”–to me it was a great visual of entertainment, always wondering what was going to happen next, enjoying the magical illusions, never being able to guess the next move, wondering how each character fit. I truly enjoyed it. 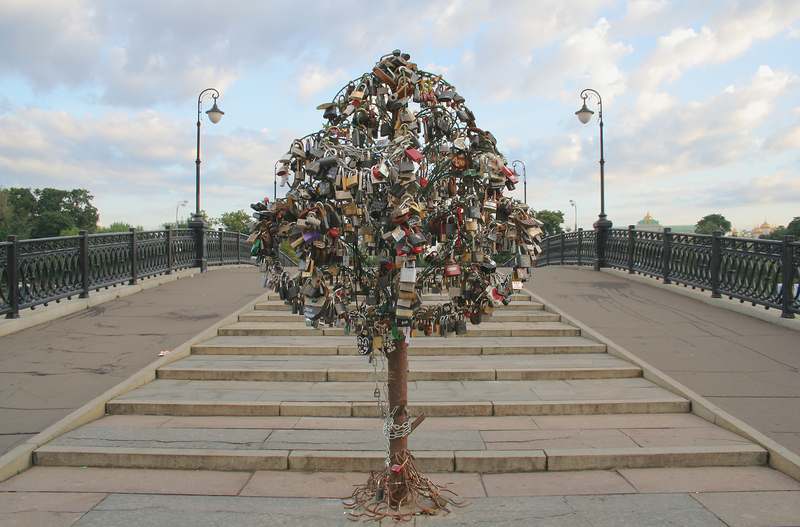 At the end of the movie there is a scene on a bridge & the bridge was covered in padlocks. To me it was a visual wonder & i wanted to know more, so I googled and found “Love padlocks”–people place padlocks in certain places to symbolize their love they want to hold onto–called Love padlocks. All over the world there are specific locations, some the beginning of the padlocks is a mystery, other stories are of lovers lost, hope of lovers returning, wishes of romance, etc. It is a beautiful symbol of a cherished, heartfelt gesture. Love is funny like that. 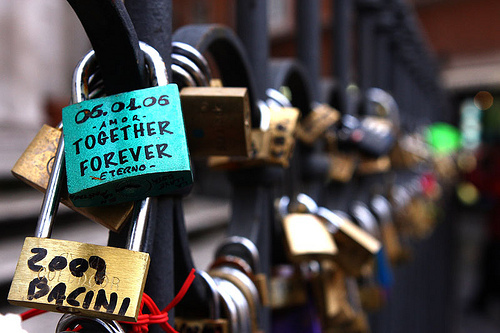 So much of our life is seeking and finding someone to share your life with, the days, the moments, the laughter, the hurt, the pain…if you were able to meet someone & literally padlock their love, would it truly be a good idea? Would you miss the challenges that turn into making up? Would you miss the moments where you grow together? Would you begin to take your love for granted? Would you try as hard to hold on to the special feelings you have for one another? Would the affection be as passionate if you knew it could not be taken away? Would you miss the moments of insecurity that bring you back to finding a place of gratitude in your heart for one another? Would you cherish your time together? The padlocks did remind me of a time where my husband and I were going through a hard spot emotionally and I was feeling very vulnerable to situations that could possibly ruin our relationship. I remember giving him a set of three keys and explaining they were a visual of the keys he holds to the heart of our family. One key was to symbolize each one of us in our little family & every time he looked at the keys he was to realize the importance of what he held within—our hearts. Relationships are like that, you are given opportunities to learn from another, to invest in their life story, to see glimpses of who they really are, to be trusted with emotional keys, so remember in any relationship you are in, hold a knowing that you are unlocking a piece of someone’s padlocked heart where they hold hurts, sensitivity, hopes, dreams, and they are inviting you in to experience a part of it. Be gentle, be wise, be loving, be kind. Find a location, list those you love & make a loving wish that they will fill your life with continued LOVE. You could also do a fun family lock where everyone lists their names & makes a wish. You could hang it somewhere special in your home, yard, car mirror or find a special location that is special to your family. Previous FAMILY should be a safety net—how is yours holding up?